A Vision Mobile report in its IoT series about Open Source based on the findings of the 10th edition Developer Economics is now available and we have the highlights. Meanwhile there's still a few days left to take part in the April-May 2016 survey. 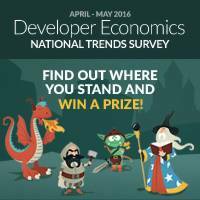 As the Develop Economics survey is made by developers, for developers the questions are very relevant! They are one topics like programming languages, platforms, app categories, tool categories, revenue models and, as this one is entitled Developer Tools Benchmarking, tools. One incentive for contributing to the research is to get feedback about you how your answers compare you to other developers in your country by way of a custom scorecard and to receive a free report with its findings. If you provide your email address you can be entered into a prize draw up to six times and if you join the Vision Mobile Developer Panel you also collect point toward an Amazon Gift Card - see Be Counted In the Next VisionMobile Survey for more info or just take the Survey.